Fri, Jul 6, 2018, 10:42 am SL Time, ColomboPage News Desk, Sri Lanka. July 06, Colombo: Sri Lanka will be able to attract more investors and will have more economic benefits if it adopts a new Constitution, outgoing U.S. 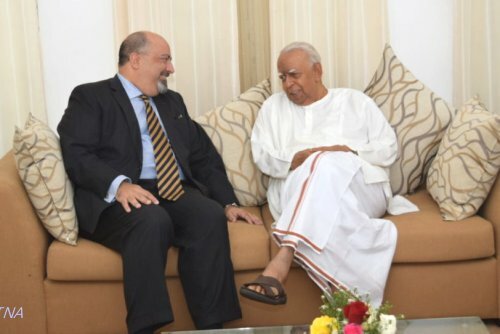 Ambassador Atul Keshap has told Sri Lanka's Opposition Leader R. Sampanthan. The U.S. Ambassador has made this remark when he paid a courtesy call on the Leader of the Opposition and the Tamil National Alliance (TNA) yesterday at the office of the Leader of the Opposition in Colombo, according to a statement issued by the Opposition Leader's office. During the meeting, the Ambassador has pointed out that as far as the United States is concerned that the UNHRC Resolution remains operative and it is fundamental for several bilateral relationships. He has said the objectives of the country should remain positive in order to achieve peace and reconciliation and the positive image that the Government of Sri Lanka has in the international stage should not be taken for granted. Expressing his views on the current state of affairs Mr. Sampanthan pointed out that the Government is yet to accomplish most of its commitments to the International community. "The expectations of the international community in the best interest of the people of Sri Lanka has not been fulfilled by the Government of Sri Lanka," said Mr. Sampanthan. Highlighting the commitments made by the Sri Lankan Government in the cosponsored resolution adopted at the United Nations Human Rights Council in 2015, Mr. Sampanthan said "the Office of the Missing Persons was established after a long delay, the Reparations bill is not yet passed, there had been no steps taken to address the Accountability issues, the commission on Truth Justice Reconciliation and non-Recurrence has not been constituted, the Constitutional process took a positive start but there seems to be delay in taking it forward". "Given the fact that there had been plenty of work done around the framing of a new Constitution for over 25 years, I don't see any justifiable reasons for delay in this. Our primary interest is in the best interest of the country, and everyone in this country will benefit from a new Constitution," said Mr Sampanthan. Mustering a two-third Majority in Parliament need not be that difficult to adopt a new Constitution, he added. "Vast majority of the Tamil People who live all over the country including the North and the East want a solution within a united undivided Sri Lanka, there are sections of people not substantial but vocal who adopt a hardline view, but the only way to silence them and keep them away from negatively influencing the community is to deliver on the promises said Mr. Sampanthan. We have been absolutely reasonable in our demands," said Mr Sampanthan, adding that if the Government does not deliver the Tamil people are not going to be second-class citizens in this country. 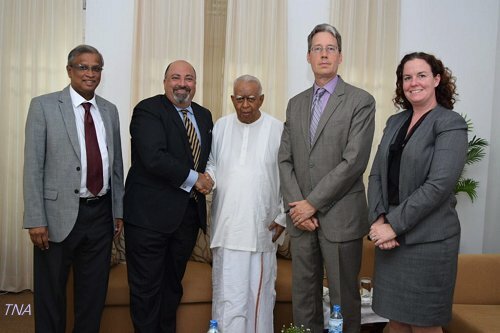 Mr Sampanthan has appreciated the role played by the Ambassador and his team and the US state department in the past with regard to Sri Lanka and appealed that the same level of engagement should continue with all parties in the future. The Ambassador has assured that the United States of America will remain fully engaged with the progress made by the Sri Lankan government in the future. He also thanked Mr. Sampanthan for his support during his tenure as the Ambassador, the statement said. Along with Mr Sampanthan TNA Spokesman and the Jaffna District parliamentarian M.A. Sumanthiran was also present at the meeting while the Ambassador was accompanied by Deputy Chief of Mission Mr Robert Hilton and Ms Joanna Pritchett, the Political Officer.